New Swiv-L-Flex® swivel fittings and adapters from Saint-Gobain Performance Plastics are safe and secure sanitary connections for pharmaceutical, biopharmaceutical, dairy, food and beverage applications. Designed for easy hot water washdown, Swiv-L-Flex®'s innovative, patent-pending design features preloaded PTFE and stainless steel thrust rings for smooth operation without end play. The double-seal construction provides a leak-proof seal, while the heavyduty retainer virtually eliminates clip ring failure and fitting blow-off. 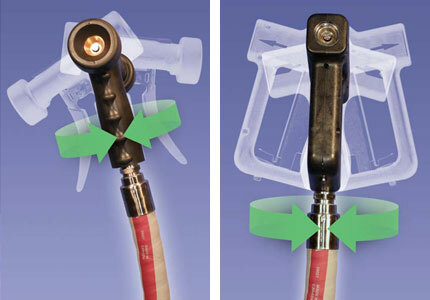 Compatible with Saint-Gobain Performance Plastics' great variety of rubber hoses, silicone hoses, and fluoropolymer-lined hoses, Swiv-L-Flex® fittings and adapters use materials that meet stringent FDA requirements and 3-A sanitary standards. They are the operator's dream for easy hot water washdown applications in pharmaceutical, food and beverage, as well as dairy industries. Swiv-L-Flex® is a registered trademark of Saint-Gobain Performance Plastics.